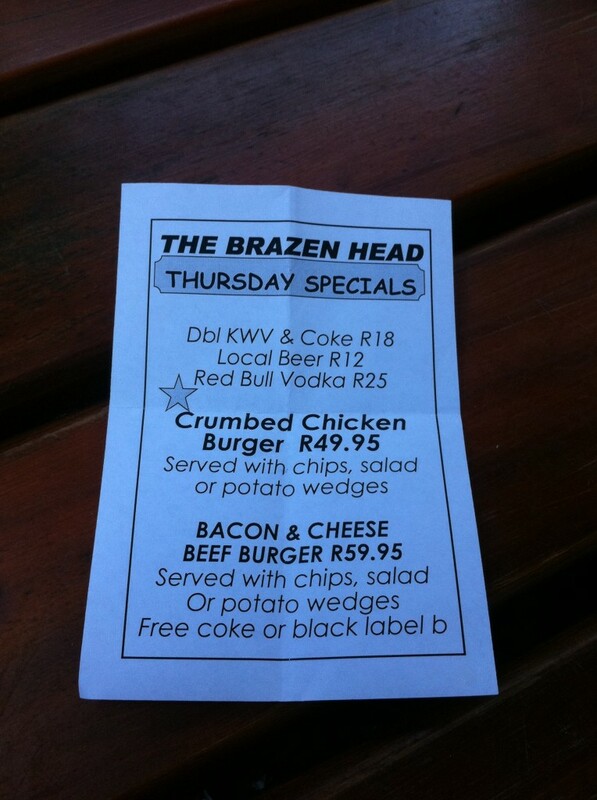 The Brazen Head in Stellenbosch is a great little venue tucked right next to Bohemia. On Thursdays they offer a great range of specials on food and drinks. A double KWV and coke will set you back R18. Local beers are R12 and a Red Bull Vodka is R25. Their delicious Bacon and Cheese Beef Burger with a choice of side and free coke or black label is only R59.95. The Crumbed Chicken Burger with a choice of side is R49.95. We love you long time Stellenbosch and Brazen. Mooi. Enjoy! This entry was posted on Thursday, August 23rd, 2012 at 1:41 pm	and is filed under Specials. You can follow any comments to this entry through the RSS 2.0 feed. You can leave a comment, or trackback from your own site.